The Create Function Step On dialog box lets you hold the same value over a selected number of frames for multiple parameters (pos x, scale y, etc.). This works well when you are animating drawings on 2s or 3s, for example, and you want to hold the same value for a function over those two or three frames. Go to the top menu and select Windows > Toolbars > Scripting. Right-click on the empty space near the top of the interface and from the quick-access menu selecting Scripting. Right-click on the empty space near the top of a view and from the quick-access menu selecting Scripting. In the Scripting toolbar, click on the Manage Scripts button to open the Scripts Manager window. In the Scripts Manager, in the Files section, select the file TB_CreateStepsOn.js. The functions associated with that file appear in the Functions section. In the Functions section, select TB_CreateStepsOn. The Add script to toolbar button becomes active. 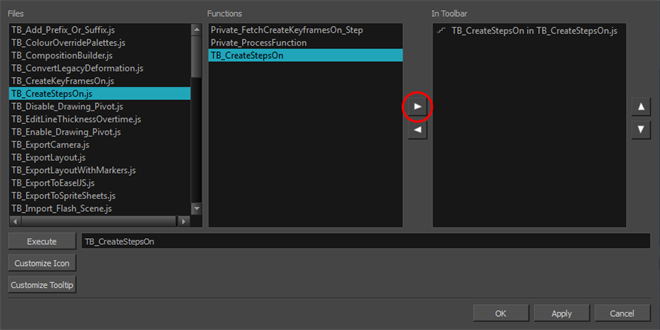 The TB_CreateStepsOn script button is added to the Scripting toolbar. In the Timeline view, select the layer whose parameter values you would like to hold. In the Scripting toolbar, click on the TB_CreateStepsOn script button. The Create Function Step On dialog box appears. 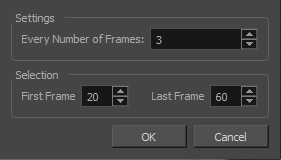 Enter in the number of frames you would like to hold your functions. Enter in the frame number of where you would like the stepped holds to start. The playhead location determines the lowest value you can enter for the first frame. You need to move the playhead to frame one if you would like to set frame one as the lowest possible starting value. Enter in the frame number of where you would like the stepped holds to stop.